LIMITED TIME - SPRING SALE! Note: When filling out the order form, please enter the information for your vehicle, that the Sync 3 unit is going to be installed in, NOT the information of the salvaged vehicle it was sourced from (if applicable). The 17 Digit Vehicle Identification Number (VIN) is REQUIRED on all orders to ensure correct programming is provided, based on specific vehicle equipment and options. This order is for programming only (Sync 3 Hardware NOT Included). Customer must purchase all necessary installation hardware needed for vehicle from a third party. Customer is responsible for any and all wiring modifications, if required. Do NOT, under any circumstances, connect a Sync 3 Unit to Wi-Fi or Bluetooth (FordPass App) before it is programmed to your vehicle. Doing so can overwrite your original programming with all the incorrect information contained in the Sync 3 unit you connected, before it was programmed properly. Other: Any OBD Programmer, not on this list, that you have personally verified works with FORScan on your vehicle and can access APIM (As-Built Data) without issue. Customer should receive FORScan APIM Programming File within 48 hours, although typically most are completed same day. Be sure to check your SPAM /JUNK folder in case message containing programming file attachment/instructions gets incorrectly flagged, by your email provider, as Spam. Note: 4" Displays to 8" Sync 3 Conversions will REQUIRE wiring changes and repining Ford wiring connectors to a different configuration, unless a custom wiring conversion harness is utilized. The Sync 2 (MyFord/MyLincoln Touch) GPS Antenna (GPSM Module) is NOT compatible with Sync 3. Both Navigation Equipped and Non-Navigation (Compass Only) Sync 3 Units Require a GPS Antenna to function. The GPS Antenna is still used by the compass and Apple CarPlay in the Non-Navigation units. On some vehicles, mainly 2015+ model years, you may notice the compass flopping back and forth between directions or not saying the correct direction. This is due to double CAN Bus messages with the compass signal, which it is receiving from both the GPSM module and the Sync 3 APIM. 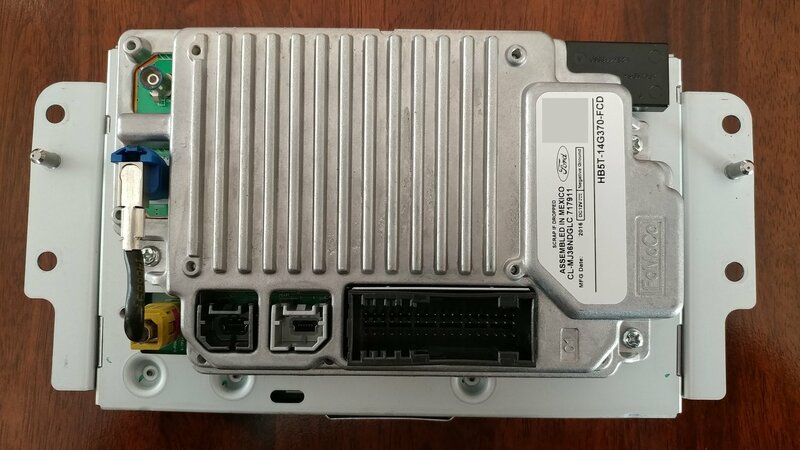 This mainly depends on the firmware version present on the GWM (Gateway Module) which has the OBD connector. If you notice this phenomenon, just disconnect the GPSM module in its entirety. It is not needed for Sync 3 and is only required in some vehicles to retain the functionality of the compass present on the instrument cluster or dashboard. Sync 3 is compatible with the newer 2016+ Ford Roof Mount Antennas, such as the Shark Fin Style. You can remove your existing antenna and install a 2016 Antenna, if desired and available. Just make sure it is the version for a navigation equipped vehicle. You will also require a new splitter on the end of the line behind the dashboard/center console to split off the SiriusXM and GPS signals. The 8" Standard Mount is generally compatible with or found in a: Ford C-MAX (2013+), Escape (2013+), Expedition (2015+), F-150 (2015+), Focus (2012+), Fusion (2013+), and Mustang (2015+). Lincoln MKC (2015+), MKZ (2013+), and Navigator (2015+). Use this list as a general guide for cross compatibility of Sync 3 Screens. Always visually verify and confirm Sync 3 screen type before purchasing, to make sure it will fit your vehicle accordingly. Existing Sync 2 (MyFord/MyLincoln Touch) Screens will NOT work with Sync 3. The touch screen type, connectors for the APIMs, and screw mounting locations are completely different. Some vehicles will lose their automated Active Park Assist support when upgrading from Sync 2 (MyFord/MyLincoln Touch) to Sync 3. This is due to an incompatible firmware version found in the PAM Module. Due to Sync3Programming.com having no physical hands-on involvement for the Sync 3 Upgrade Installation. The Customer, End User, and/or Vehicle Owner is responsible for any and all malfunctions including, but not limited to, improper installation of Sync 3 hardware, software, programming, and related components should one occur. No liability will be accepted/assumed beyond purchased programming fee amount. Installing non-approved hardware, software, programming, and related components may have vehicle warranty (if applicable) repercussions, should an issue arise directly caused by such modifications. Do not purchase if you do not accept or understand this agreement. Should you feel uncomfortable physically installing Sync 3 unit yourself, seek assistance from your local Car Audio Shop. Ask any install or ordering clarification questions before purchasing programming services. The brand names Ford, Lincoln, and Sync 3 are all owned and copyright Ford Motor Company and their other respective owners. Programming requests are processed within 48 hours (most completed the same day).